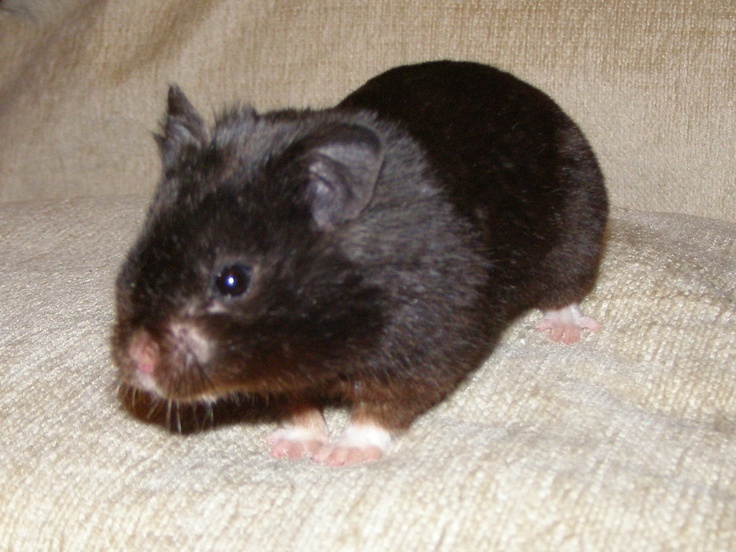 Black Bear Hamsters are a type of teddy bear hamster that were first bred in 1985. They're predominantly known for their black fur and are incredibly popular for the unique shading and fun-loving temperament. These hamsters are far more laid back than most other hamsters - with the exception of their exercise regime. In order to maintain proper weight, a black bear hamster should have a hamster wheel or some other form of entertainment to keep it from becoming fat. A plastic hamster ball is strongly recommended when they're outside of their cage. Black bear hamsters are extremely simple to handle and only grow up to 5-6 inches long at adulthood which makes them very easy to manage. It's only nicknamed 'The Black Bear' because of it's glossy black coat that resembles a bear. Be sure to keep it down though, these hamsters hate noise and they live up to 3 years so be prepared to keep it down for awhile! Once you buy your hamster be sure to give it some space before you handle it regularly. Most people recommend waiting about a day before you begin playing with your new black bear hamster so it can become acclimated to it's environment. They're not naturally aggressive but they may accidentally nibble your finger thinking it's food. There are some great store-bought black bear hamster foods that you can use like 'Hazel Hamster'. Be sure to only give them a small amount or they'll just hide the excess and get fat off it. These hamsters are very clever and will try to steal food whenever possible and stash it away. You can also give it some piece of string cheese or egg but be sure to tidy up after feeding and don't let anything uneaten rot in their cage. Be sure to give your hamster plenty of salt blocks that it can munch on to avoid it chomping on your cage and damaging it's teeth. Black bear hamsters often like to nom nom nom on something and it you don't provide it with mineral blocks it'll use the cage which is very bad for it. Other than that, be sure to clean it's cage and change it's water regularly - the general rule of thumb is once a month you'll need to completely remove everything from the cage and wash it out. Be sure to let the entire cage dry before placing new saw dust inside to prevent mold or mildew from forming. Other than that, enjoy your awesome black bear hamster and make your friends jealous!